The Trump administration says it plans to let some countries off the hook from steep tariffs on steel and aluminum. But far from soothing fears of a trade war, the exemptions could make the situation worse. President Donald Trump is expected to formally announce tariffs on US imports of steel and aluminum as early as Thursday. The administration has signaled that Canada and Mexico will be spared from the measures while they renegotiate NAFTA, the agreement that opens trade among the three countries. The White House has suggested that other countries could also get special treatment. It's still unclear what final form the plan will take. Experts, business leaders and investors already concerned about Trump's proposed blunt tariffs on steel and aluminum imports are flashing warning signs. Dangling exemptions for Canada and Mexico "undermines" the administration's argument that the tariffs are needed to protect US national security, according to Inu Manak, a visiting scholar at the Cato Institute. The tariffs are "being used by the president as a bargaining chip," Manak wrote in a blog post Tuesday for the research organization. Mexico and Canada have been spared from US tariffs on steel in the past. In 2002, the George W. Bush administration slapped temporary tariffs of up to 30% on all imported steel in an attempt to protect US producers from a deluge of imports. With Mexico and Canada exempt, their steel exports to the US soared, according to a US government report. 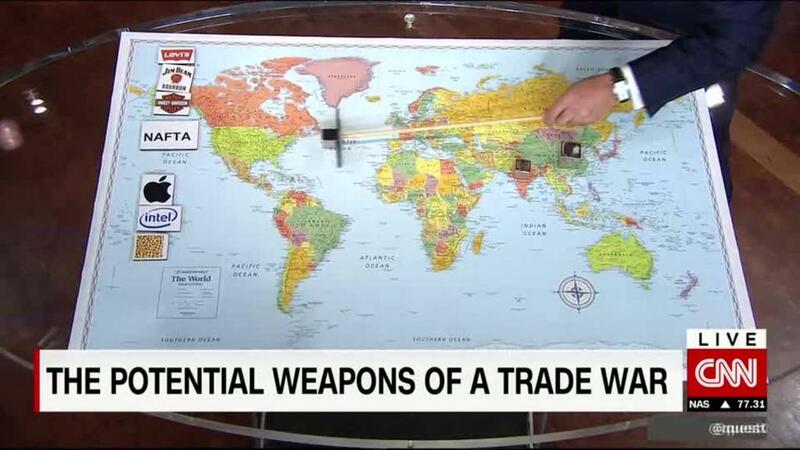 Bush's tariffs didn't last long. The World Trade Organization ruled against the US, which led to a raft of retaliatory sanctions from big trading partners like the European Union. Bush ended up dropping the tariffs in 2003. The saga was "a good example of the concerted resistance by US trade partners," said John Tang, an economics professor at Australian National University. Trump is likely to run into similar challenges if he goes ahead with the planned steel and aluminum tariffs. Bryan Mercurio, a professor of international trade at the Chinese University of Hong Kong, predicts the United States will quickly face cases at the WTO, which it's unlikely to win. Even countries who are initially exempted from the tariffs may still file trade discrimination cases against the US at the WTO. They "may not want to establish a precedent and leave the proposed tariffs unchallenged," Tang said. Commerce Secretary Wilbur Ross on Wednesday insisted that Trump was showing "a sensible, balanced degree of flexibility" in deciding how to implement the tariffs. "I think you're going to see, as you understand the details of what actually is going to happen, that we're not trying to blow up the world," Ross said on CNBC. The possibility of some countries being spared from the tariffs, which Trump's trade adviser Peter Navarro had previously insisted wouldn't happen, raises the question of what the administration is trying to achieve with the measures. "We're talking about a very crude implementation of a very blunt instrument," said Alex Capri, a professor of international trade at the National University of Singapore. Canada is the biggest exporter of both steel and aluminum to the US by value, while Mexico is the third biggest for steel and in the top 10 for aluminum, according to data for 2017 from Panjiva, a global trade research firm. If they are both left out, the tariffs would still affect other countries that Trump has accused of playing unfairly on trade, including China. But the amount of steel and aluminum China sells to the United States is just a fraction of its overall exports of the metals. Chinese steel and aluminum shipments to the United States have already been targeted by previous waves of heavy sanctions. "The new US tariffs would have little direct impact on China but would mostly harm exports from US allies," Chad Bown, a senior fellow at the Peterson Institute for International Economics, wrote in a blog post Wednesday. -- CNN's Patrick Gillespie and Jethro Mullen contributed to this report.